Ocean and beach inspired, this bracelet reminds me of sunlight glinting on water! All sparkly and silver. Memory wire is threaded through the handmade Viking Knit chain giving 4 wraps at the widest part. 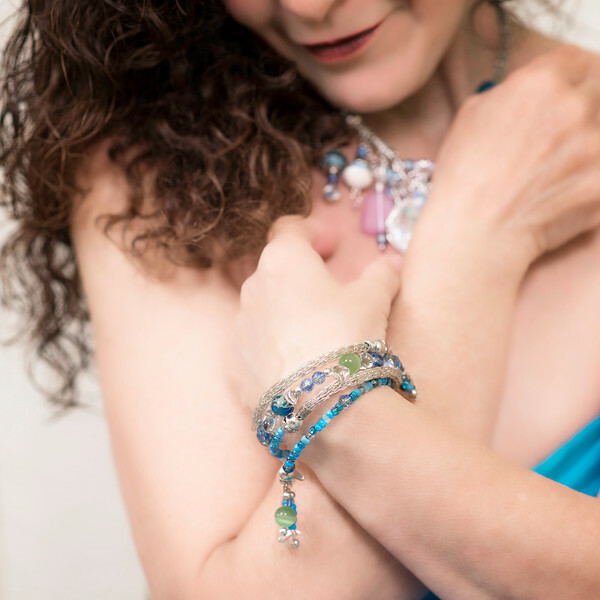 Pale blue and turquoise tiny glass beads on one wrap, viking knit on 2, and lacy serpentine, blue, green and clear drop beads on the 4th. Pretty bead dangles finish off the ends. This bracelet will fit most wrists from small to medium sized.